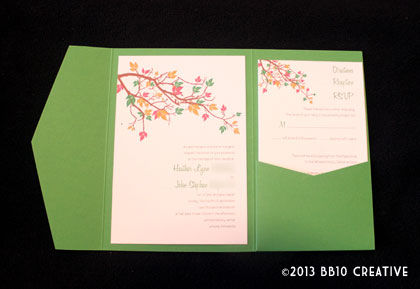 Fall wedding number six of the year for BB10 Creative was a late addition to the fall wedding line up, and also is a special addition for me because it is my dad’s wedding! 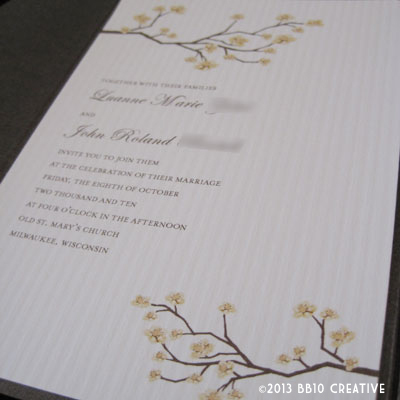 John and Luanne decided to plan a small fall wedding in October and were looking for creative invitations with a chocolate brown and ivory theme. We had a short planning meeting to view paper swatches and discuss design ideas and I told the happy couple to leave the rest up to me! 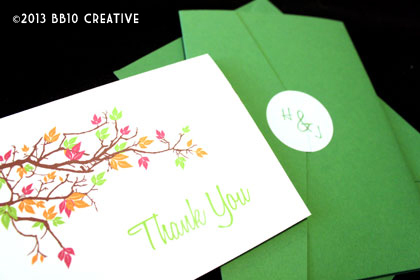 After viewing a few design options, John and Luanne settled on a very simple, formal and elegant fall design of two brown tree branches with ivory blooms. We used a formal serif font paired with a formal script and printed the invitations in brown on one of my favorite textured papers. The columns texture in an ivory shade adds a touch of elegance to any invitation. 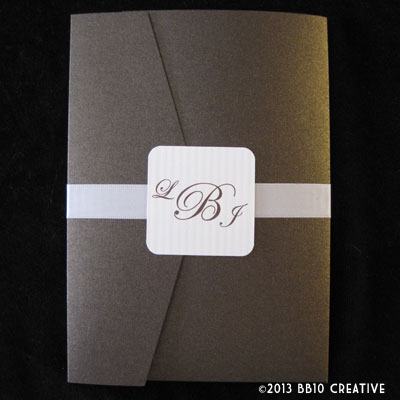 The invitation is housed in a rich chocolate brown metallic pocket enclosure. 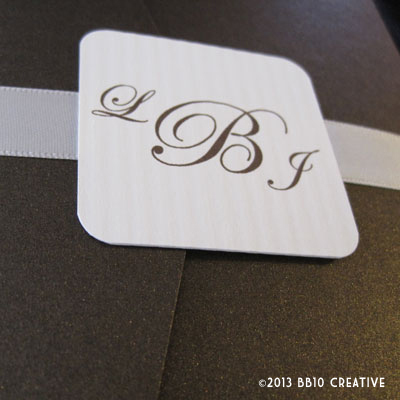 To add to the elegance, we sealed the enclosures with a matching ivory satin ribbon and a chocolate brown monogram. 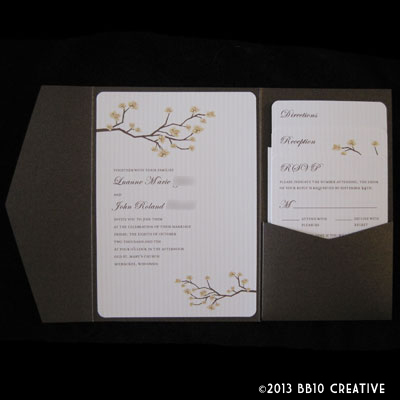 Since this was a smaller set of invitations, I was able to use a corner punch on the cards to achieve the rounded corner effect. 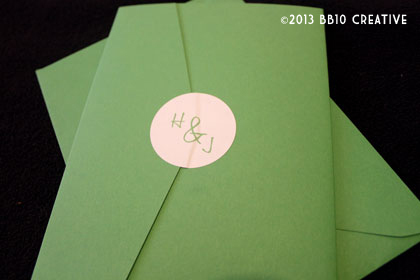 The invitations were mailed in a matching ivory columns textured envelope. 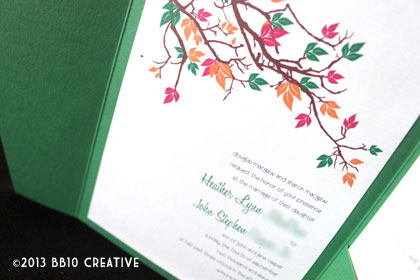 Overall, it was a very short turnaround process to get the invitations designed and mailed but I love the final result. The brown metallic enclosure paired with the ivory textured paper is a gorgeous combination. 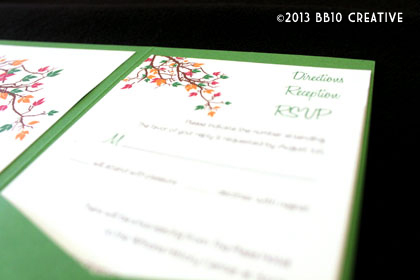 Program and place card designs are still in the works, so check back soon for a shot of all the final products. 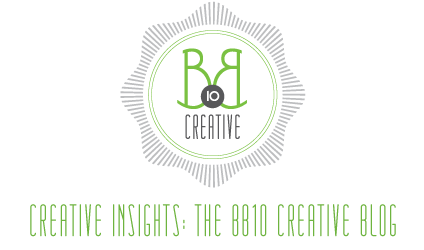 And make sure to follow us on Facebook for the latest on BB10 Creative projects!